Blessings to all of you! Happy Purim! Tonight, at sunset, the Festival of Purim begins. Purim is a “minor Jewish festival” that falls on the 14th of Adar. A “Jewish” day is always sunset to sunset, so the Festival of Purim begins tonight, March 20th at sunset and will continue through March 21st. Purim is a Jewish Festival, but it’s not included in the book of Leviticus and is NOT one of YHWH’s Moedim (Feast Days), or God’s yearly appointments with mankind. Purim shows up in the book of Esther. Esther is often overlooked by Mainstream Christians, but it is really an awesome book because it paints a picture or “type” of the love story between King Jesus and the Bride of Christ. Esther is the only book in the Bible that doesn’t mention YHWH (God) by name. However, if we have eyes to see, we will SEE God’s hand of PROVIDENCE working in and through the people of the book of Esther to orchestrate and bring about events exactly as HE had planned. So it is with us today, that the unseen GOD is constantly working through events, circumstances and people to bring about His Mighty Will. Esther is an EPIC LOVE story! Within its pages, we have a King, a hero, a heroine, a villain, and a God who is always working behind the scenes. To make it the perfect love story, the book concludes with a happy ending. The “King” in the book, though flawed by his human nature, becomes a “type” of our Messiah King Jesus. Esther is a “type” of the Bride of Christ. Let’s dig into the story. The setting is the time of the Diaspora. The Temple had been burnt to the ground, and at this point, Babylon had fallen to Media/Persia (Modern Iran). 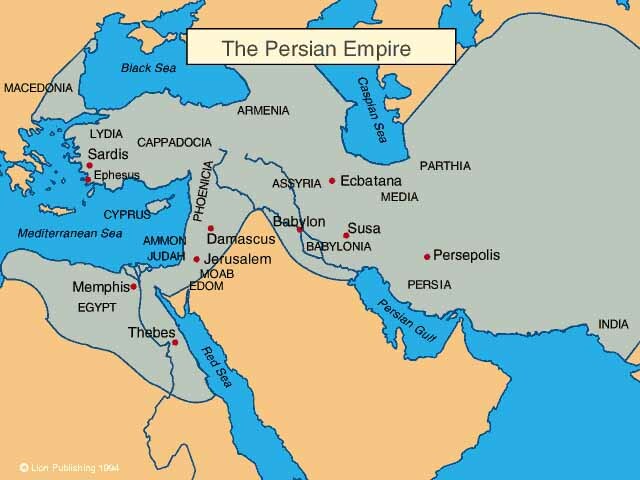 Many Jews were living in Persia at this time. This story takes place in the city of Susa, about 250 Kms east of the Tigress River. King Ahasuerus was ruling Persia. He had a very beautiful wife named Vashti. During one of his banquets, King Ahasuerus became inebriated with wine (his heart was “merry with wine”). Feeling “merry” he decided to show off his Queen.Vashti had been throwing her own banquet for the women of Susa, and so she refused to come at the King’s command. This was a HUGE and public slap in the face to the King. He was very angry, and after consulting with his legal advisers, he decided to “put Vashti away”, to basically divorce her, or remove her from being queen. This reminds me of the Parable of the Wedding Feast. In the Parable told by Jesus, the Father YHWH had prepared a Wedding Banquet for His Son (Jesus). During the days of Jesus, the Father first invited the Jews to the wedding Feast. We saw in a previous post that the Gospel of the Kingdom of God would first be presented to the Jews, and later the Gentiles. This is because our God is a Covenant God, and He was still married to ISRAEL (the Jews). The Northern Tribes had been scattered throughout the earth. But, like Queen Vasthi, Israel (the Jews) REJECTED their Messiah and refused to come to the BANQUET. This angered the Father, so He instead sent out invitations to the Gentiles, inviting them to the Wedding. This was the start of the Church Age. Back to the story of Esther. Vashti REFUSED the King’s invitation so she was REMOVED from being queen. After this, the King grew lonely so his wise men advised him to have a sort of beauty contest. He would invite all of the beautiful young virgins of the land to come before him, and he would choose a queen. The young maidens were to receive a full year of beauty treatments before going in to see the king, including six months with oil of myrrh and six months with spices and cosmetics. The maidens were put in the care of the King’s Eunichs. Enter our hero and heroin. At this time, a young Jewish woman named Hadassah, was being raised by her uncle Mordecai. When she was called up to be in the beauty contest, Mordecai advised her NOT to let anyone know her origins (that she was Jewish). She was given the Persian name of Esther. Esther was very beautiful and she quickly found favor with the King’s Eunuchs and was given the best spot within the harem. After her year of beautification was complete, Esther was called to go before the King. King Ahasuerus fell madly in love with Esther and made her Queen. Mordecai, concerned for his niece, kept watch at the king’s gate to ensure that Esther was doing okay. Mordecai became aware of an assassination “plot” against King Ahasuerus. He told Esther of the plot who then informed the King in Mordecai’s name. The plot was investigated and found to be true, so the perpetrators were hung on the gallows. Now here’s where we really see God’s Invisible Hand of Providence beginning to work in and through the “characters” of this story. Enter the villain, the evil Haman “enemy of the Jews”. Haman was an Agagite. Haman was likely a descendant of Agag, king of the Amalekites, long-time enemies of the Jewish people. The Amalekites were part of the original Canaanites that God had commanded His people to completely remove from the land. They were mixed with the blood of the Nephilim and were very evil, having a particular hatred for the Jewish people. After Esther was made queen, King Ahasuerus promoted Haman and gave him authority in Persia. The King was not aware that Haman was an enemy of the Jews and he was also not aware that his beloved Queen Esther was a Jew! As she had been instructed by Mordecai, Esther kept her origins hidden so the King assumed she was Persian. Haman had a “run in” with Mordecai when he demanded that Mordecai bow down to him and pay him homage. 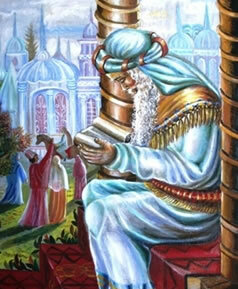 Mordecai refused because he would only bow down to the God of Israel. Haman became enraged and plotted to have not only Mordecai killed, but all the Jews in Persia completely wiped out. He tricked the King into giving him the King’s signet ring and issuing an IRREVOCABLE EDICT for all the Jews to be annihilated on the 13th of Adar (Jewish month). Haman “cast lots” to determine which day would be ‘THE DAY’ to destroy all of the Jews! Casting lots is kind of like drawing straws. Mordecai learned of the plot and immediately went to Queen Esther. Queen Esther was distressed, but she was frightened to go before the King. The rule was that if anyone went before the king without being summoned (including the QUEEN), they would be KILLED …UNLESS the King held out His Sceptor. Esther then invited the King to a banquet in which she included only 3 people total, herself, the King, and the evil Haman. Haman, who had no idea that Esther was a Jew, was basking in the fact that he was invited to this “special banquet”. He totally thought that he was about to be honored before the King. Esther did not reveal the plot to kill the Jews that night, but instead called for a 2nd banquet. We don’t know if she got cold feet or why she called for the 2nd banquet. But what we do know is that this “Divine Delay” created a chain of events that can only be described as the work of Almighty God. The night after the 1st Banquet, Haman returned home elated and called for a special gallow to be built with which to hang Mordecai the next day. Remember, he had a particular hatred for Mordecai. That very night, King Ahasuerus was having trouble sleeping. He found an old book of records which reminded him that Mordecai was the one who had informed Queen Esther of the assassination plot against his life. That VERY NIGHT he determined to have Mordecai honored. But the evil Haman later misunderstood him and thought that he was the one who was going to be honored! It’s just so perfect! In a beautiful turn of events, Haman was FORCED to PUBLICLY honor Mordecai! He was enraged! It’s now the night of Esther’s 2nd banquet. Haman went to the banquet disgusted at having to honor Mordecai. It is at this 2nd banquet that Haman’s betrayal was revealed to the King, and also that Esther was a Jew! The King was ENRAGED at Haman! Haman was literally hung on the very gallows that he had rapidly built for Mordecai! Not only that, but Haman’s 10 evil sons were also hanged on the same gallows! Deuteronomy 21:23: His body shall not remain all night upon the tree, but thou shalt in any wise bury him that day; (for he that is hanged is accursed of God;) that thy land be not defiled, which the LORD thy God giveth thee for an inheritance. There is one last plot twist that has to be addressed. Every edict that is sealed with the King’s SIGNET RING CANNOT be REVOKED! The edict to have every Jew (man, woman and child) annihilated on the 13th of Adar had already been sealed! Even the King himself could not revoke the edict! So Mordecai and Esther decided to issue a second edict! Mordecai is given the King’s signet ring! The 2nd edict declared that the Jews had the RIGHT to DEFEND themselves! The Jewish people of Persia were therefore warned way in advance of the irrevocable plot to take their lives so they had plenty of time to prepare and train to defend themselves. As it turned out, when the armies went in to destroy the Jews, the Jews defeated the armies and were victorious! Esther then commemorated that day and called it Purim. The origin of the word `Pur’ would seem to be Persian. As written in the Book of Esther, it means a “lot”. Purim is the plural form of the word `Pur’, and thus means “lots”. The festival is called Purim because of the lots cast by Haman to determine which day to kill the Jews, the 13th of Adar. This Festival is celebrated as a commemoration of how God intervened through His chosen instruments, Mordecai and Esther, to stop the plot to kill all of the Jews! God placed Esther “in the throneroom” for SUCH A TIME AS THIS! For the Christian, Esther is a “type” of the Bride of Christ. Like Queen Vashti, the Jewish people rejected their MESSIAH YESHUA, refusing to attend the wedding banquet! 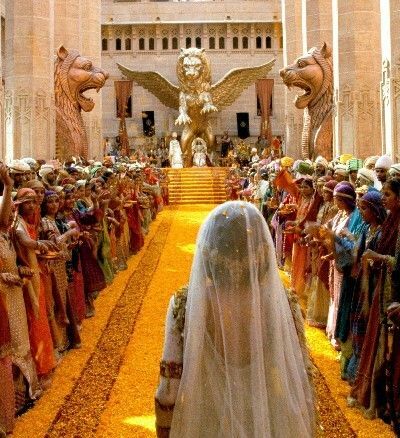 Like Queen Esther (Gentile/Persian name), our ELOHIM has put the Gentile Christians “in the Throne Room for such a time as this.” At the time of the crucifixion, the veil in the Jewish Temple was torn in half! Jesus made a way for BELIEVERS to come boldly before the very throne of God through His Shed blood on the Cross! In these last days, the evangelical Christians (believers in Jesus) were instrumental in the decision to REcreate the State of Israel in 1948. America, a “Christian nation”, has also been integral to the protection of the State of Israel, the nation of the Jewish people. Do the “sons of Haman” still want to destroy the Jewish people and the state of Israel? Do you think BELIEVERS are interceding for the Jewish people before the Throne of YHWH? “Israel has no better friends, I mean that, no better friends in the world than the Christian communities around the world,” Prime Minister Benjamin Netanyahu told a Christian media summit in Jerusalem last year.